Click here to return to the Groovy Hex Editor home page where you can download the software! This software is compatible with Windows version 95, 98, ME, NT, 2000, and XP. Read this article to find out what a Groovy Hex Editor is, what makes it special, and why it's better than all of the other hex editors out there. Even learn some background about hex editors. 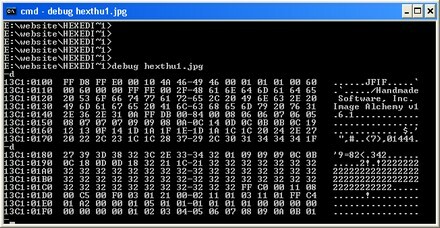 Groovy Hex Editor is a tool for editing binary formats. I've paid particular attention to making it colorful and easy to use and tried to give it a cool looking color scheme (hence the name "groovy" hex editor). It's a fully functional hex editor with many advanced features. You can toggle the display between hex and decimal, and there is a built in inspector that easily lets you see the hex, decimal, and binary equivalents of a group of bytes at once. 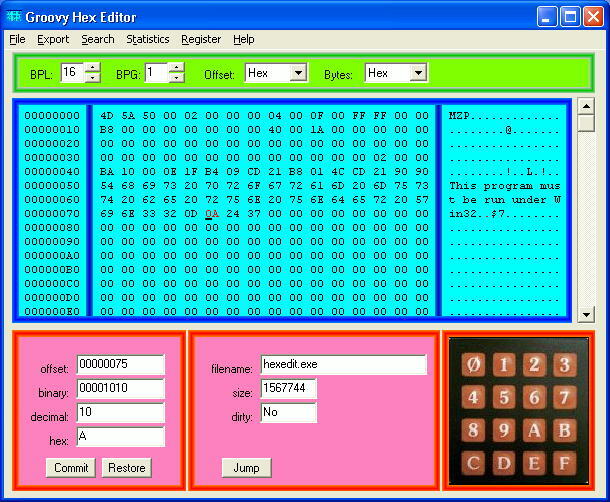 Groovy Hex Editor can be downloaded for free. To get started, follow this link to the home page of Groovy Hex Editor, where you can download the software, view screen shots, etc. So what makes it better than the competition ? Fifty-dollar "demos". These cost $50 to register, and the unregistered version has disabled features, or expires after 10 days. Typically, you install such a beast, forget about it, and then two weeks later want to use it and find it won't work because it "expired" on you, and you can't use it unless you pay $50 bucks. That won't happen with groovy hex editor -- it has no expiration. Freeware. There's some freeware programs out there, and sure they're free, but understand that most things that are truly free also aren't very good. Often these things are "abandonware" -- i.e. programs that the author isn't developing any more. Buggy Mess. The "buggy mess" is the half-assed program that you download that doesn't work. It's usually flakes out somewhere in the middle of what you're doing and causes you to lose your work. No expiration. You don't have to worry that next time you want to use it, you're going to get one of those "The evaluation period has expired, you're screwed!" popups. Groovy Hex Editor does NOT expire. I'll let you test it for an unlimited time period. No disabled features. You're not going to put 30 minutes into editing your latest savegame file, only to get a popup that says "Sorry, to save you're data file, you need to register.". Groovy hex editor is fully functional. No bugs. Well, no bugs might be a bit of an understatement, but generally speaking, I am a professional shareware developer and for the most part, my software works as I say it does. If you do find a bug (ahem "undesirable feature" as we like to call them), please let me know at smbaker@sb-software.com and I'll fix it. So how do I make money with no expiration, no disabled features, etc ? My philosophy is to offer my software at a low price, so that everyone can afford it. Those who aren't going to pay wouldn't pay no matter if you throw a million disabled features, expirations, and a whole grab bag of tricks at them. They're still not going to pay. Those who will pay, on the other hand, usually pay with just a little encouragement. They understand that I'm a struggling shareware author, they understand that my software is useful to them, and they're willing to support my efforts. Hopefully you fall into the latter category (those who support the software they use). If so, take advantage of my offer to try out Groovy Hex Editor for an unlimited period of time, and if it works for you, send that $15 my way. I understand some people are down on their luck (been there) and some are students (done that) and some just can't afford to pay a registration fee, even the modest $15 that I'm asking. If you do fall into this category, and the software is useful to you, then there are still lots of things that you could do to help me. The biggest is just to tell your friends and recommend the software. I get most of my customers from "word of mouth", and it really helps when you suggest the software to others. Similarly, putting a link on your homepage or some other page that you own on the internet really helps out because it helps drive people to my site. Ahh, the good old DOS days. Up until I wrote Groovy Hex Editor, I still tended to use DEBUG when I needed to make some quick changes. In fact, just about all modern hex editors for windows share a look and feel that can be traced back to "debug". The problem with debug is that it was tedious to use. The mechanism for making changes was difficult, there was no such thing as scrolling, search and replace were primitive, etc. There certainly wasn't any multilevel undo or redo. At its base, Groovy Hex Editor has your standard hexadecimal grid right there in the middle that can be traced all the way back to "DEBUG". Along the left side are offsets, and along the right side are ascii characters. Groovy Hex Editor allows you to toggle the hex grid between hexadecimal and decimal. Humans think a bit more clearly in base-10 than they do in base-16 sometimes. In the lower left there's a handy "object explorer" that lets you see the current byte (or word) in binary, decimal, and hex simultaneously. There's a lot more features than are readily apparent on the main window. The little pull-down menu at top contains the mighty undo and redo features, for example. There's even a changelog that can show you all of the edits that you've made to the file. The tools menu has all kinds of useful contraptions and gizmos. There's a "string sifter" that can automatically pull all of the ascii strings out of the file for you and show them in one convenient spot. There's even some things that were thrown in just for fun and to make the software unique -- like the VFD clock display. So why is it called "Groovy" hex editor ? The basis of the name came from a friend who looked at the main window and said "wow that color scheme's groovy!". Seriously though, I've found that there is a lot that goes into choosing the name of a shareware program. At the base level, a name ought to convey the purpose of the program (i.e. "hex editor"). But you also want something catchy and unexpected. Something that when a person is looking at a page full of similar programs, it catches his eye whereas the others don't. That's how I came up with "Groovy Hex Editor"
Where can I get some other groovy software ? The SB-Software Shareware Page has all of my current projects on it. Most of the software is very much down to business and kind of boring -- things like website and server tools. If you're looking for some cool desktop gadgets, you can check out my freeware Binary Clock and Nixie Clock programs.